In late December 1815, two years have passed since four of the five sisters of the Longbourn estate traversed many complicated webs and winding routes to land husbands in Jane Austin’s much beloved Pride and Prejudice. 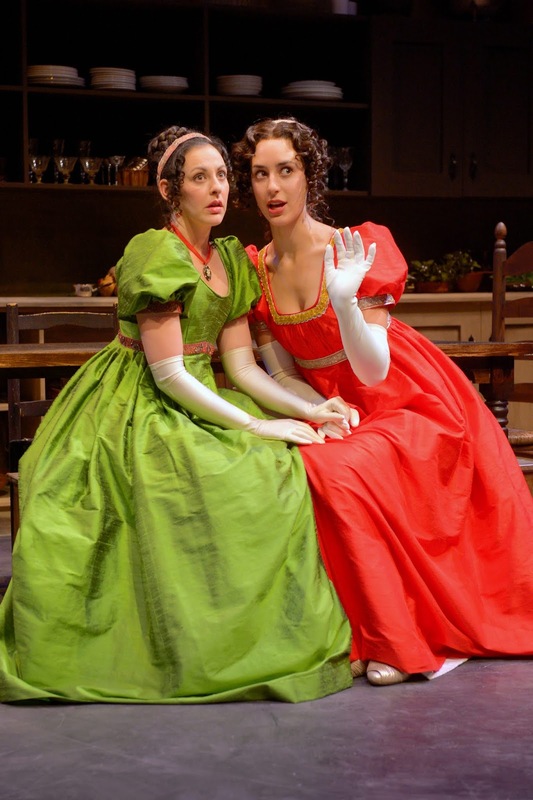 Now as December arrives in 2018, two years have also passed since Marin Theatre Company joined in a three-theatre, rolling premiere of a Lauren Gunderson and Margo Melcon play that picks up and continues the original Jane Austin story (a new work that has been the most produced play in the U.S. for the past two years, including a much-loved production last year at San Jose’s City Lights Theater Company). 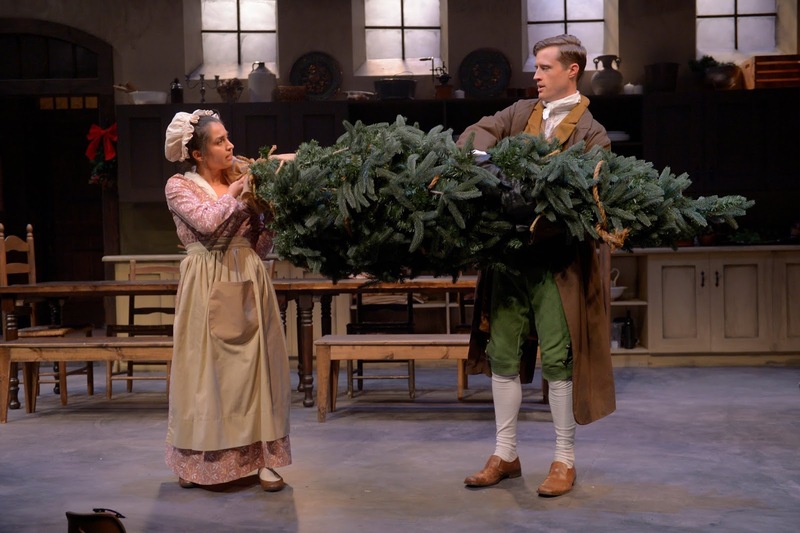 Miss Bennet: Christmas at Pemberley that made its MTC premiere in 2016 picks up Jane Austin’s original story and relates how the fifth sister -- a rather-odd-one-out, committed spinster Mary – surprises herself and all her family as she stumbles onto her one true love while the family convenes at Christmas at Pemberley, the ancestral estate of sister Elizabeth’s husband, Fitzwilliam Darcy. The playwright team of Lauren Gunderson and Margot Melcon has now returned to the same household and the same few days in December to tell the story again, this time relating what is going on in the basement where the servants of the household hold reign. 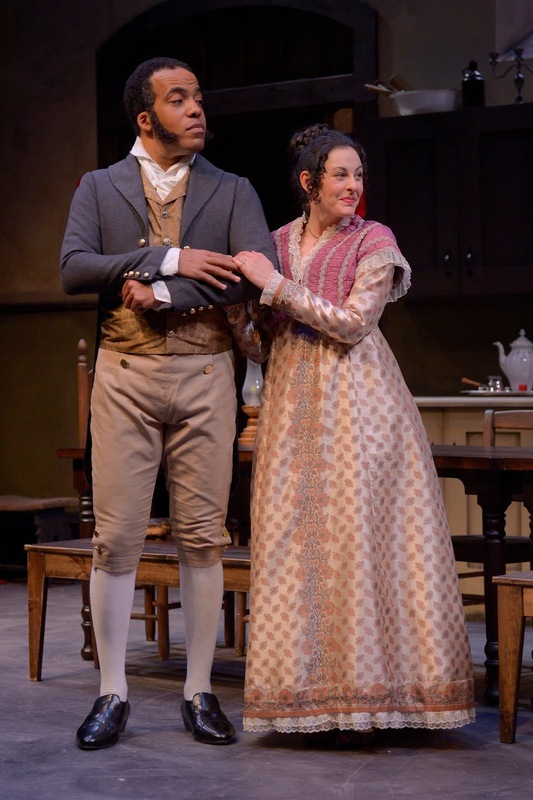 Marin Theatre Company once again premieres a visit to Pemberley -- The Wickhams: Christmas at Pemberley – one that is likely to become just as popular on holiday stages across America as has its predecessor. Not only is this MTC premiere once again enchantingly captivating, often funny, and in the end heart-warming, the play is quite enlightening about the role of women in the early 1800s of England and the possibilities for self-empowerment even when most laws and customs of the land were stacked totally against them in favor of men -- especially husbands. As the large family of tittering, bickering, and gossiping sisters and brothers-in-law arrives upstairs, three of the estates servants scurry below to shine silver, iron clothes, deliver sherry, and ensure the basket of biscuits (i.e., sugar cookies in the shape of stars) remains full. Those biscuits appear to be a key reason the estate’s couple, Elizabeth and Fitzwilliam Darcy, and one sister, Lydia Wickham, continue invading the large kitchen – as well as their searching a reprieve from all the hustle and bustle of invading relatives above. One thing that becomes quite clear: When the landed aristocrats arrive in the domain of head housekeeper, Mrs. Reynolds, they are no longer in territory that they totally control nor one where they will always have last say. 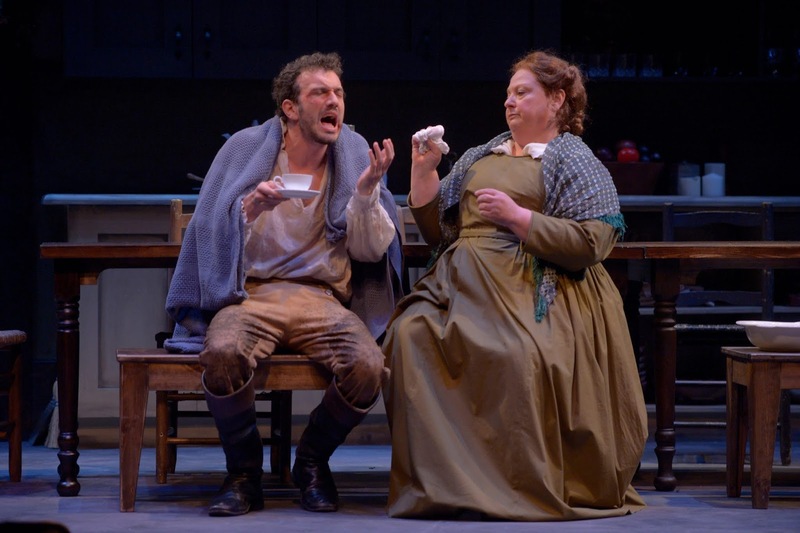 Jennie Brick is the formidable Mrs. Reynolds – formidable in size, in demeanor, and often in tongue. She is not past speaking defiantly in the face of the master of the house, Mr. Darcy; and she certainly is quick and prone to correct and command the other two servants, footman Brian and temporary help for the holidays, Cassie. Mrs. Reynolds is not in any way mean, but she is also not one with a ready smile. She does not take praise well (“Praise slows me down”), and she does not take well to any sort of change in the kitchen kingdom she controls. When inventive Brian presents a new cutting board he has created in order to shape multiple, star-shaped biscuits in one swoop out of dough, Mrs. Reynolds humphs, “I don’t want things that are done easily: I want things done well ... 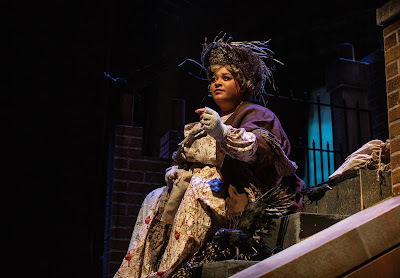 Invent on your own time.” Jennie Brick is scrumptiously delectable as the head cook, household manager, opinionated observer, and all-around ruler of the down-below (and maybe even the up-above). Her charges include a well-spoken, quick-to-like Brian, whose proper posture and English as well as curiosity and creativity immediately seem more than one might expect from the household’s footman and all-around servant. 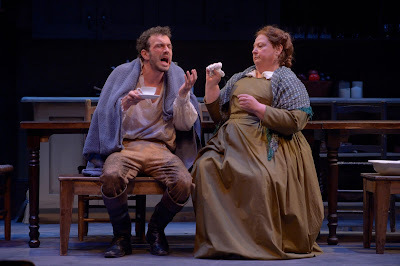 August Browning’s Brian has very exacting ways of speaking and very endearing ways of conversing with whomever wanders into the kitchen. He particularly perks up whenever the newly arrived Cassie is in the room -- a girl he has known since school days (and one who has more than once beat him in playground foot races). 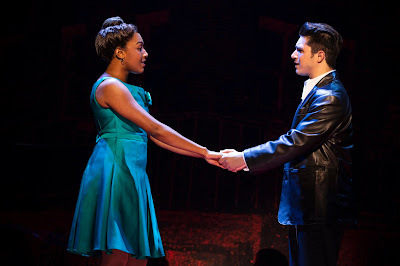 In his star-struck eyes and his attempts to engage in small talk with her, there is no doubt Brian has long-term dreams about his relationship with Cassie. Down the stairs and into the dawn-to-midnight world of ever-increasing tasks and pressures that these three face as Christmas Day approaches come with much regularity the master and mistress of the household and one sister who feels particularly alienated from the rest of her family. Melissa Ortiz is Elizabeth (Lizzy) Darcy -- a quite gleeful, completely kind head mistress who pops in for quick chats, a few nicely asked commands, and of course, for biscuits. She is also bold in her new ideas, like introducing a tree into the household for Christmas – an idea she picked up from German tradition and one that the entire downstairs thinks is quite strange. 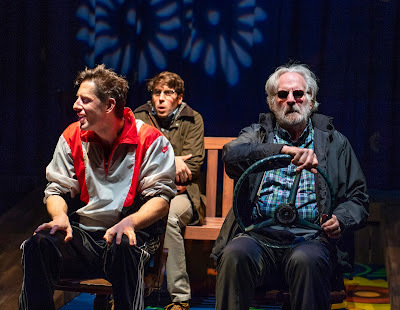 But to the house in the middle of night does come a stumbling drunk, bruised and black-eyed, and totally disheveled George Wickham (a perfectly matched for the scoundrel’s role, Kenny Tull). A surprisingly sympathetic Mrs. Reynolds (who clearly once loved him much as she watched him grow up) allows him to stay but warns him to stay hidden in the basement -- neither to be seen by his wife (who continually pines away for her absent husband whom she has not seen in some weeks/months) nor certainly by Mr. Darcy. The appearance of the wandering prodigal – whom we soon learn has no livelihood, is a womanizer, and yet can be quite charming in his own rough way – ignites a series of unfolding discoveries that transform the basement’s kitchen into a beehive of angry accusations and shout-filled confrontations. All starts with Cassie’s discovering a letter in George’s muddy coat as she washes it. The gasps of surprise, disgust, horror, and even delight the note elicits (according to who happens subsequently to be reading it) sets up a flurry of activities that the celebrating family members above have no idea are occurring. As events unfold from Christmas Eve through Christmas Day and into Boxing Day, we witness heretofore hidden, powerful aspects of Elizabeth, Mrs. Reynolds, and eventually even Lydia emerge. We see a Cassie who remains true to her posture of high integrity and her firm ambition to better herself in her own independent way; but we also see her new lighten up her whole countenance with ah-ha’s about what life might offer for a future that she had once rejected. Out of a family crisis that never reaches the upstairs celebrations emerges personal transformations and new opportunities for happiness for all those who live in and venture in the house’s below – save the wily and truly wicked George. For those in the “down-under,” Christmas goes from bleak to blessed, largely due to feminine courage, initiation, and cultural boundary-busting. Megan Sandberg-Zakian directs with a pace of both alacrity and occasional, welcome pauses the whirl of downstairs events, never leaving us breathless but always keeping our undivided attention and desire to see what happens next. Wilson Chin has created a massive underground world of a plain-walled but stately kitchen that is its own bounded territory, separated from the glittering festivities above by a fortress-like, wooden staircase heading up and to the right. The set’s large, opaque windows clearly help us understand this domain’s inhabitants are separated in more ways that one from the outside world around them, with the excellent lighting schemes of Wen-Ling Liao adding to the atmosphere of shadows and diffused light that exist in the massive basement. Liam Roddisil and Rachel Hurado have populated the scene with dozens of properties that authenticate and give personality to the servant’s busy basement. Sharath Patel helps establish both the era and the season through her choice of music as sound designer while the costumes of Courtney Flores ice the cake in defining the upstairs/downstairs nature of the story as well as enhancing the various personalities, strengths, and faults of the characters we meet. 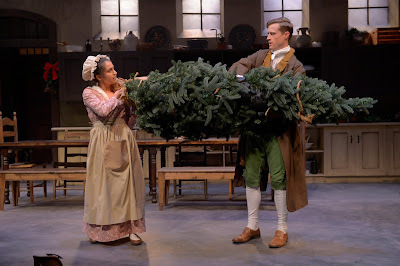 The Wickhams: Christmas at Pemberley continues in an extended run through December 16, 2018 at Marin Theatre Company, at Marin Theatre Company, 397 Miller Avenue, Mill Valley CA. Tickets are available online at http://www.marintheatre.org or by calling the box office Tuesday – Sunday, 12 -5 p.m.
That fatherly refrain begins to take a back seat in young Calogero’s life after he meets local, crime kingpin, Sonny. Their introduction occurs after the youngster witnesses Sonny gunning down a guy with a bat who is beating up on Sonny’s friend, with Calogero later deciding not to finger Sonny with the murder during a police line-up. 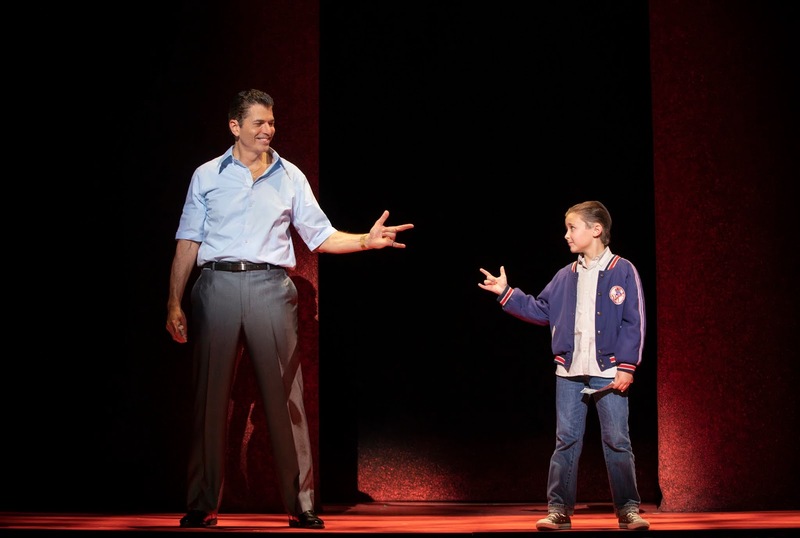 Calogero quickly becomes Sonny’s protégé and good-luck boy; and that new status is immediately noticed by the entire neighborhood who all now go out of their way to give him high-fives and call him “C,” leading Calogero to sing with much charismatic machismo (at least for a nine-year-old) “I Like It.” Frankie Leoni (who alternates the role with Shane Pry) is a winner in the role of Young C, especially coming alive with kid-filled glee as he helps Sonny win big bucks in a crap game, rolling all the right numbers while excitedly singing “Roll ‘Em” in full voice with Sonny and his gangster buddies. 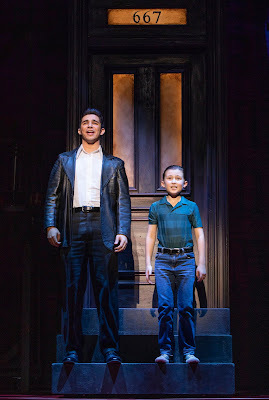 By the time Calogero grows into a seventeen-year-old (now played by Joey Barreiro), he is well on his way to becoming another of Sonny’s gang of hoodlums, albeit the most special among them. With names like Coffee Cake (i.e., acne-marred in the face), Eddie Mush (i.e., always gambles and loses); Tony-Ten-to-Two (i.e., how he points his toes); and Jojo the Whale (pretty obvious where that name comes from), these are certainly not the companions Calogero’s father wants for him. 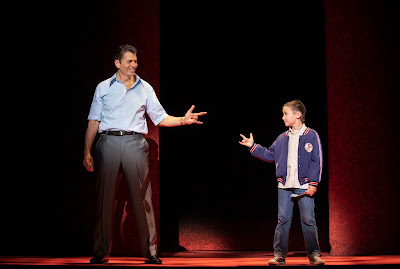 Counter to Lorenzo’s advice to his son about using his heart and not wasting his talent, Sonny advises C in a song about his hero, “Nicky Machiavelli” that “you gotta choose fear or love, kid.” C listens carefully as the tall, lanky Sonny (Joe Barbara) sings in a voice and manner reminiscent of an entertainer in a late-night, basement nightclub, “Love can always disappear, but fear is cash in the bank, kid, fear puts gas in your tank.” Sonny is a mixture of joking leader of his grown-up gang, doting mentor of his boy C, and ready-at-any-moment to be a ruthless killer with no conscience. Through it all, Joe Barbara’s portrayal wickedly lures us in to like him and want to know more about him, even when we know deep down we should be abhoring Sonny and the influence he is having on Calogero. Like many teenagers, Calogero also makes decisions and friends that his elders do not support. Forming his own teen gang of Sally Slick (Sean Bell), Handsome Nick (Giovanni Digabreile), and Crazy Mario (Joseph Sammour), C receives more advice, this time about protecting neighborhood territories and finding the right girl in a doo-wop blending of “Ain’t It the Truth.” But when Calogero dares to look twice and meet an African-American girl at his school named Jane (Brianna-Marie Bell), both he and she begin to hear from those around them, “You’re just out of your head if you think this ever could be” (“Out of Your Head”). The conflicting pulls on Calogero’s/C’s life only increase as he tries to be tough and rough with his questionable pals, loyal to his Sonny, a possible boyfriend with Jane, and still somewhat welcome in his own home (where his father is particularly at the peak of disappointment and worry). As one might expect, bad things happen; but out of bad, lessons can be learned. In one of the better moments of the evening, Sonny surprises both C and us with his advice in regard to Jane as Joe Barbara’s Sonny shows a different and unexpected side of the gangster while earnestly and with some humor singing in his Bronx-rich way about not letting “One of the Great Ones” get away. Overall, the original Chazz Palminteri story is fairly compelling as a memoir of a boy’s journey through some precarious paths, given the roadblocks he encounters of compelling crime, inbred prejudice, and natural teen rebelliousness. In its musical format, the score and songs of Alan Menken do not do much to come even within near distance to those of Jersey Boys, Guys and Dolls, or West Side Story – other musicals whose legacies echo in this musical’s various songs. 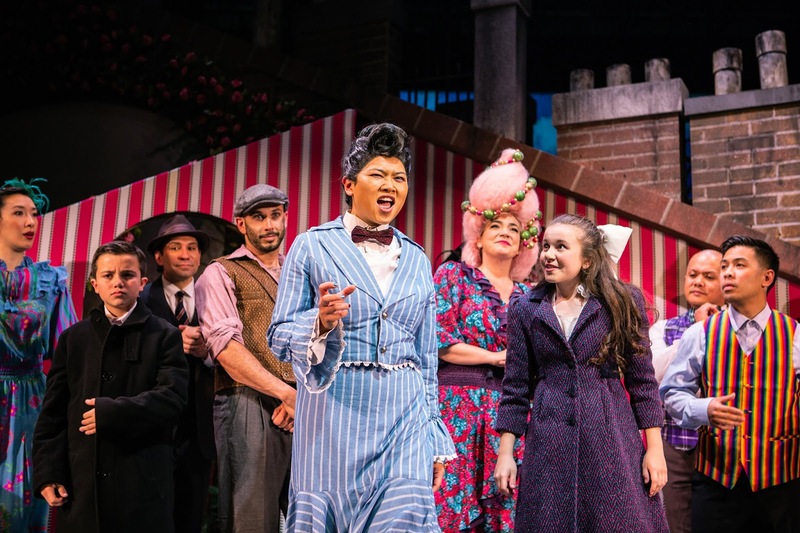 None of Menken’s tunes are ones that anyone is likely to wake up the next day humming; and even more damning, the rhyming lyrics of Glenn Slater are for the most part, bland, predictable, and unmemorable. All that said, there is nothing totally unpleasant in the ‘60s’-sounding music and songs, often sung in the close harmonies one remembers from the boy and girl bands of the time. But, there is also nothing remarkable. 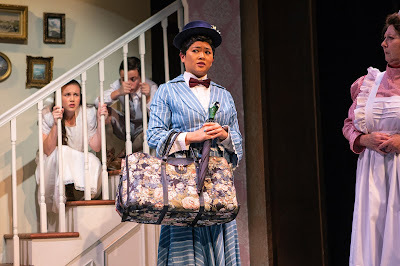 Delivery by this cast is overall respectable, with the performance of Richard H. Blake as Lorenzo reigning as the brightest spot among the soloists. The choreography designed by Sergio Trujillo smacks of the moves of back-up singers and dancers for Motown shows of the 1960s, with much grooving of bodies along with jerks, leaps, and splits, and multiple ways of expressing emotions and rhythms with hands and arms. All such numbers are fun to watch in the moment and too quickly forgotten by the end of the show. As co-directed by Robert De Niro and Jerry Zaks, A Bronx Tale moves at a pace that actually makes the evening seem shorter than its efficient two-hour running time. Costumes by William Ivey Long along with hair and wigs by Paul Huntley provide live portraits of the styles of the 1960s, especially recalling the ethnically different communities of the Bronx. The scenic designs of Beowulf Boritt depict in metal skeletons the shops, apartments, and hang outs of the Bronx neighborhoods against a backdrop of sky often lit in deep reds and purples as part of Howell Binkley’s lighting schemes. 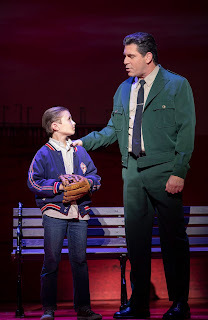 A Bronx Tale continues through December 23, 2018 at SHN’s Golden Gate Theatre, 1 Taylor Street, San Francisco. Tickets are available at Tickets are available at https://www.shnsf.com. In August 2017, I saw and reviewed Nilaja Sun's solo performance of "Pike Street" at the Edinburgh Fringe Festival. At that time, I contacted several Bay Area companies and suggested they consider bringing her and her compelling story to our local audiences. While I unfortunately am unable to attend the Berkeley Repertory appearance of "Pike Street," I am happy to re-share my review from that performance of this same show and thus to encourage my readers to attend the Berkeley Repertory show. Here is my earlier review of "Pike Street." The most remarkable part of the story being told in Pike Street is that all these and more residents of the ethnically rich neighborhood are all played by the piece’s author, Nilaja Sun. We first see the mouthpiece of this one-person show sitting with a body grossly distorted — head slanted precariously upward, mouth severely askew, and both hands and legs knotted in ways that make one cringe to see. This is our introduction to Candice, and the performer will remind us from time to time how the 15-year-old is reacting to the people and events around her. For all the other characters, Ms. Sun employs an incredibly impressive range of voices, accents, body positions, and ways of walking to bring each of the people to life. on the Roda Theatre stage of Berkeley Repertory Theatre, 2015 Addison Street, Berkeley, CA. Tickets are available at http://www.berkeleyrep.org/boxoffice/index.asp or by calling 510-647-2975 Tuesday – Sunday, noon – 7 p.m.
As the decades come and go over a thirty-year period in the life of one family, many changes occur in the world around them while in the house where the three grown children were raised, many more things stay the same. 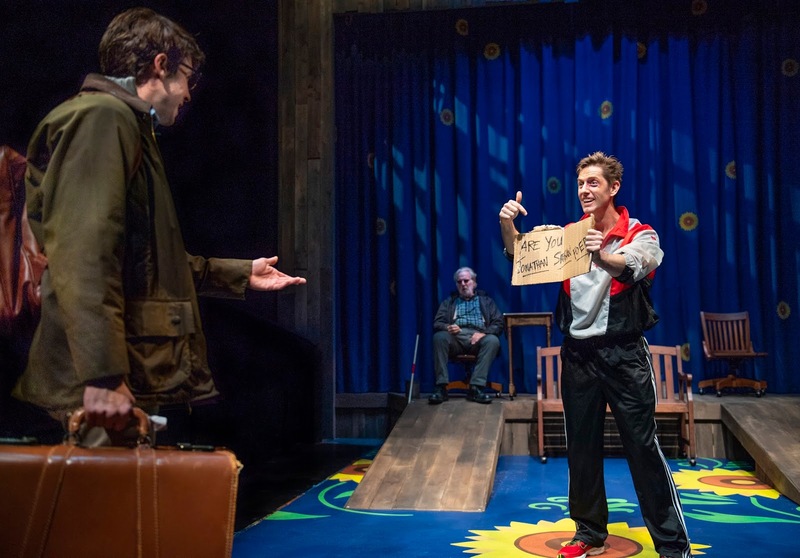 What better holiday gift could City Lights Theater Company give to its loyal audience that Sean Grennan’s Making God Laugh? Chuckles and sighs aplenty await audiences as they remember the lifeline of their own families -- probably seeing moments that look longingly, embarrassingly, and maybe painfully familiar. Making God Laugh continues through December 23, 2018 at City Lights Theater Company, 529 South Second Street, and San Jose. Tickets are available online at https://cltc.org/ or by calling 408-295-4200 Monday – Friday, 1-5 p.m.
“No one arrives in this world from nowhere.” The driving desire to know his own origins sends a young, aspiring writer in the late 1990s to the Ukraine in search of a woman in a picture identified as Augustine whom he believes saved his deceased grandfather as a boy from the Nazis during the Holocaust. He has no more information except that his grandfather’s family lived in a shtetl called Trachimbrod – a town of mostly Jews literally wiped off the map by the Nazis. 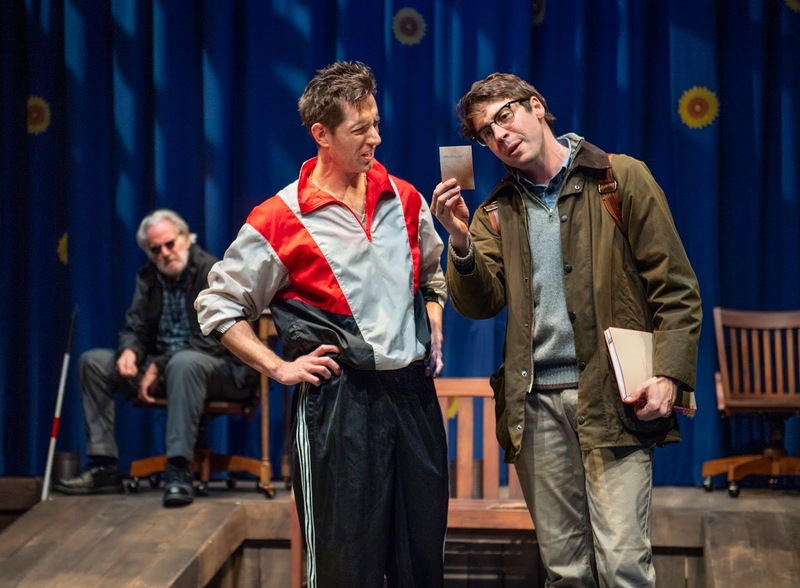 Based on a novel inspired by a similar but unsuccessful quest made by its author, Jonathan Safran Foer, Everything Is Illuminated is a play with the same name as the novel and as a subsequent, 2005 movie. 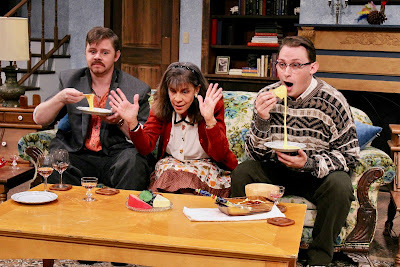 The adapted play by Simon Block is now in its West Coast premiere at Aurora Theatre Company in a production both incredibly funny and heartbreakingly sad as well as fantastically unreal and starkly harsh in reality as the search for a family’s history becomes a mixture of created fiction and discovered fact. After a grueling, twenty-six hour train ride, the twenty-something Jonathan arrives in the Ukrainian region where he believes his grandfather once lived. He is met by his two guides who “take curious Jews where they want to go” as they search for information about families that are no more. His guides are an animated, hyper-friendly contemporary-to-him named Alex -- whose command of English is hilariously barely past meager -- and his sour-faced, gruff Grandfather, who speaks no English and poses as blind and deaf when he does not want to be disturbed by others. 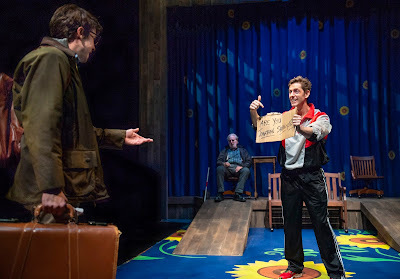 Jeremy Kahn is the overly loud, rather dramatic, and habitually intense Jonathan -- sometimes on the border of being too much so in Mr. Kahn’s quite zealous performance. Jonathan has come to the Ukraine believing his online-selected guides are experts in the Jewish history of the area and will know exactly where to take him. His crusade to know his origins have led him even to begin imagining in a journal the arrival of his great-great-great-great grandmother on the shores of a nearby river – a Moses-in-the-bulrushes-like story he is writing and that comes to life in his head and on our stage even as he is trying to find the mysterious Augustine. His almost frenetic impatience and anxiety grow when he cannot understand the conversations – often heated with much shouting – between his two guides. His nervousness of his guides’ credibility only increases when Alex says to him, “It doesn’t say that in our history books,” when Jonathan mentions how much the Ukrainians did not like Jews back during the time of the war. Adam Burch is extraordinarily exceptional in the role of Alex. From our first glimpse of him as he sits in a café wearing shiny, work-out garb and bouncing his shoulders to the background music’s beat as if in a disco, his Alex commands the stage and much of the story. He is often our narrator, always relating with a sparkle his amusement, sense of wonder, and sincere like for this Jonathan (whom he mispronounces with pride “Jonfen”) from the faraway States. He brushes off as no big deal Jonathan’s concern about his black eye that his drunken father gave him or the repeated slaps across the face he receives from the old Grandfather who clearly does not want to be on this adventure. But his Alex knows the importance to the family of earning the trust and the money of this wandering Jew from America and of the potential business he may bring or may destroy, depending on how successful they are in helping him. Marissa Keltie plays a variety of Ukrainian characters of the countryside, from a barmaid with no time for Alex’s flirting to a peasant in the field with threatening shovel, with no time for his inquisitions about a town called Trachimbrod. The latter’s reaction to that town’s name is a mirror of each person in the play who first hears the name: A moment’s stunned silence and look of dread, followed by a quick denial of ever hearing of the place. Tom Ross directs a first half of this two-hour, thirty-minute play often with light-hearted, comical touches that can border on cartoonish. An all-day car ride through the countryside takes on laugh-out-loud dimensions when the auto -- consisting of two wooded chairs and a bench, all on rollers -- turns, twirls, and twists in all directions and combinations of position as the journey goes nowhere in finding the illusive Trachimbrod. 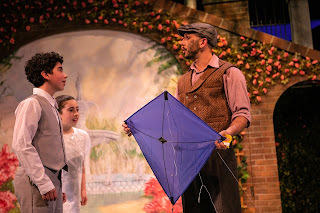 Kate Boyd’s scenic design makes big use of over-sized, yellow flowers from the Ukrainian countryside with lighting by Kurt Landisman adding patterned shadows of rotating suns and dappled canopies of trees. Matt Stines creates the sounds of an old dog and older car, an idyllic countryside, a train-station café, and bone-shattering thunderstorms – all resulting in the story becoming ever the more vivid on a mostly bare stage where only suggestions of scenes are made. In the second half, Jonathan’s quest becomes intermingled with an unexpected exploration by Alex of his own history. Alex clearly knows little of his own past, wondering at one point to his Grandfather, “What did my great-grandparents do during the war? ... Who did they save?” The closer Jonathan comes to finding some of his own answers, the more questions begin to arise in Alex’s mind about his own heritage. A chance meeting in the countryside with a meek, high-voiced, sweetly pleasant woman with long, white hair becomes a major discovery for Jonathan, the Grandfather, and ultimately Alex. Her house that is a magical wall of shelved memories -- created through the masterful properties design of Eric Johnson -- becomes the foundation for multiple surprises. 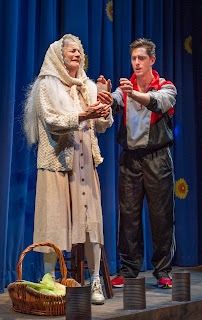 As the old woman, Lura Dolas at one point provides one of the evening’s most spell-bounding, heart-wrenching sequences -- relating in carefully chosen, excruciatingly painful words a history that further unlocks memories and secrets of the Grandfather. Subsequently, Mr. Lopez-Morillas also holds the audience in silent, stunned attention as the Grandfather’s heretofore-shuttered memories begin to pour forth. The awarenesses that come to light in Everything Is Illuminated raise many questions as well as incite important truths. Our histories are deep and are always with us whether we know the details or not – to the point we each probably sometimes do as Jonathan does in his journal and imagine in our minds from where our unknown histories long ago originated. We are also reminded that our futures go beyond us and live on in legacies of the unborn, as is hinted by the Grandfather who emphatically says more than once, “A father is always responsible for his son.” But what do we do when remembrance leads to incredible pain and guilt or when discovery ushers in scenes difficult to forgive even from those we love the most? Are there times it is just better to imagine where we came from rather than actually find out? The Aurora Theatre Company production of Jonathan Safran Foer’s Everything Is Illuminated (as adapted by Simon Block) lures us in with scenes silly yet intriguing, takes us on a journey where sunny skies darken as shadows grow, and lands us in discoveries difficult to accept but important to comprehend. 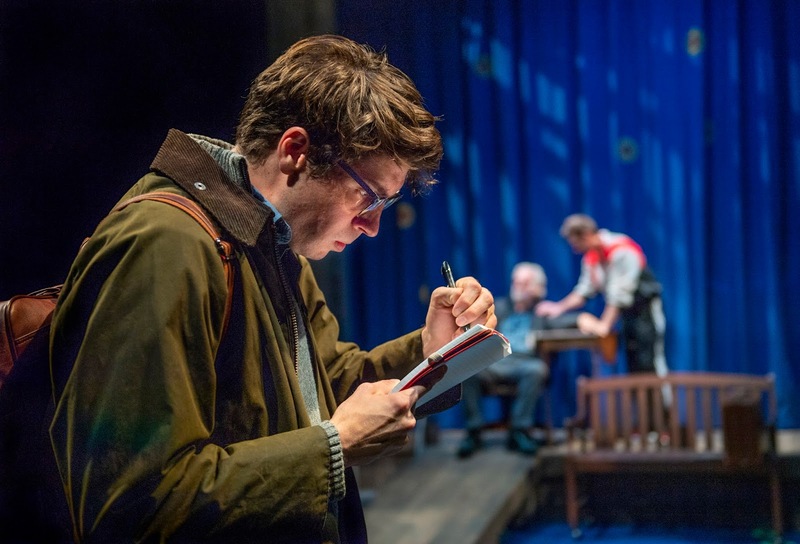 The play’s mixture of a writer’s real-time experience and his created fantasy results in an evening that cannot help but leave us with new regrets of never-conceived generations due to entire families lost as well as renewed appreciation of the generations saved and those who saved them. Everything Is Illuminated continues through December 9, 2018 at the Aurora Theatre Company, 2081 Addison Street, Berkeley, CA. Tickets are available online at https://auroratheatre.org or by calling 415-843-4822. In 2008, a musical that opened on Broadway and went on to win four Tonys that year (including Best Musical) quickly established itself as one that would influence a new generation of stage musicals. 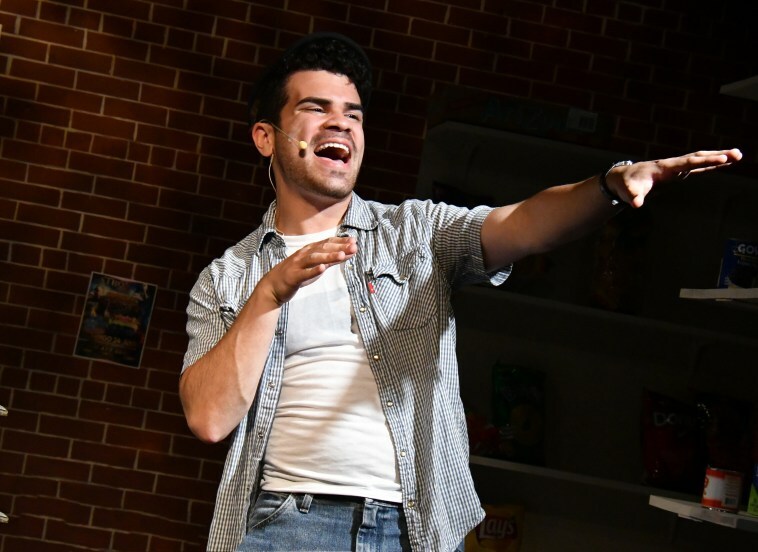 Not only was the large cast all but one of Hispanic/Latino backgrounds who freely spoke much Spanish throughout, the music that In the Heights introduced to Broadway was the kind of freestyle rap and hip-hop beat that would one day be used to even a greater extent in the phenomenal, further ground-breaking Hamilton. Lin Manuel Miranda wrote the music and starred in both shows, with Quiara Alegria Hudes (winner of 2012 Pulitzer Prize for Drama for her Water by the Spoonful) contributing the book. In the Heights takes place in a largely Hispanic-American neighborhood of Washington Heights, New York City, with its initial staging featuring an entire barrio of family owned businesses and a large cast of twenty-plus. 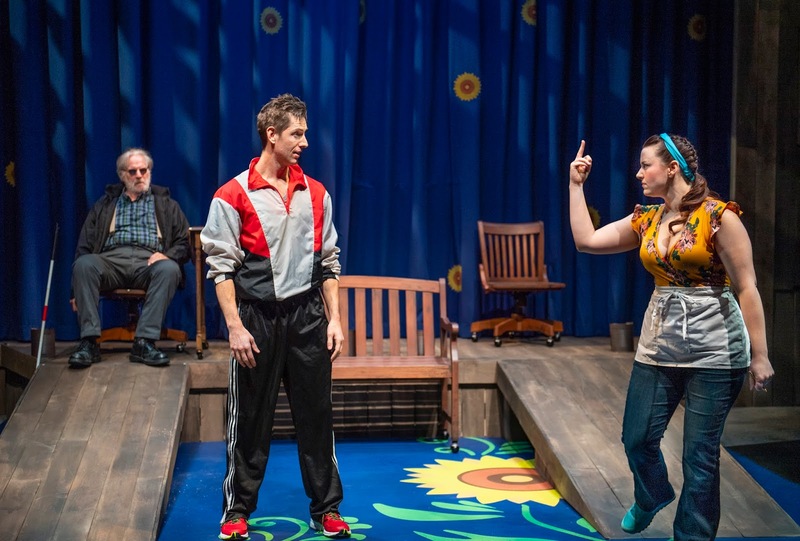 Custom Made Theatre Company has a reputation for taking big-stage, well-known musicals and daring to produce them on its rather miniscule stage in the intimate theatre barely seating fifty (e.g., Chess, Man of La Mancha, Next to Normal). In each case, critics and audiences alike have applauded both the effort and the result. 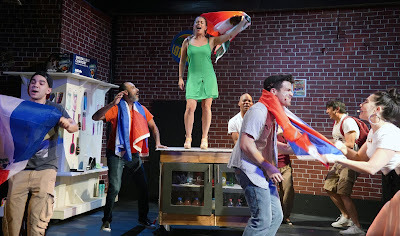 To end its 2018 season, Custom Made Theatre Company tackles with much vim and vigor the rap, salsa, and captivating story of In the Heights, reducing the cast to an essential twelve and challenging scenic designer Mara Ishihara Zinky to create a variety of local businesses and homes using the interior of a local market and a versatile, rotating cart (which she does beautifully). While the humor, heart, and heartache of the story of a neighborhood in transition is affecting in this Custom Made undertaking, the core of the musical – the music itself – too often falls short with a cast where some members cannot consistently deliver convincingly the score’s basic requirements. 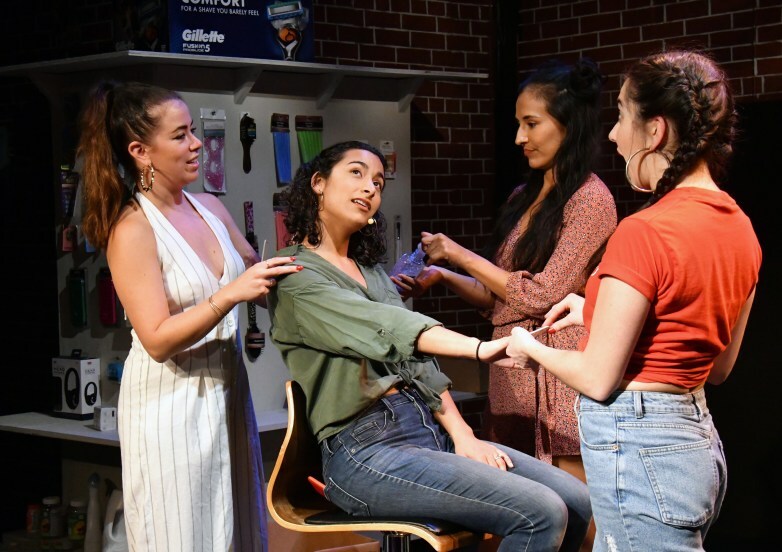 Nina Rosario (Carla Gallardo) has already flown from the neighborhood as first from her collection of friends and family to go to college – something that leads all now to burst in pride. But financial pressures at Stanford have led her to drop out after less than a year, and her return (and going four months without telling her parents she had already left the school) causes a major blow-up with her parents, Kevin (Sergio Lobito) and Camila (Bidalia E. Albanese). 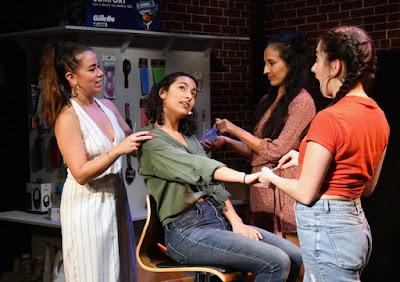 La familia of this Heights neighborhood includes the hair salon’s gossipy owner who leans toward being overly dramatic with snap and style, Daniela (Mia Romero) and her employee, Carla, the spirited Elena Estér. Graffiti Pete (Jepoy Ramos) is a street artist who upsets Usnavi with the latest creation he leaves on his store’s wall and who is seen as a local trouble-maker – more due to his low-riding pants and his proneness to slouch and desire for free Slurpies than anything he has actually done. His pal and the cousin of Usnavi who helps out at the store (doing as little as he possibly can) is Sonny, a joking, street-savvy kid with a keen eye for fairness and justice. As played with smooth-moving cool and a big smile for all, Edwin Jacobs’ Sonny is the young relative/pal that anyone would like to have. 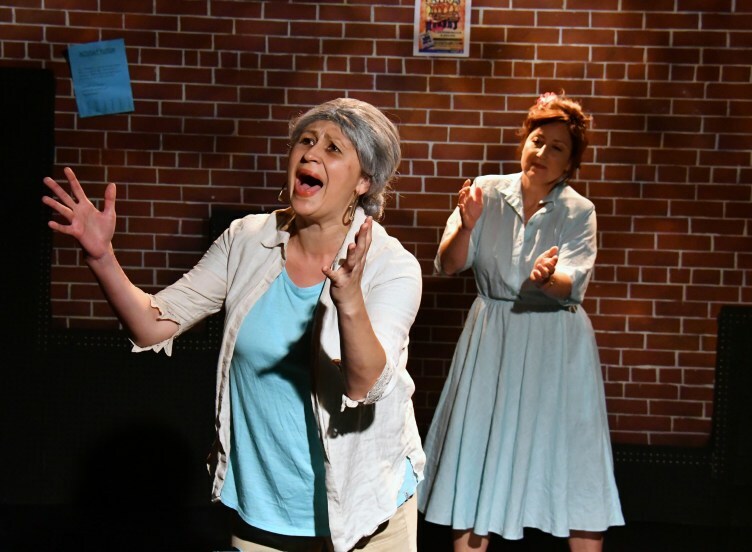 The heartbeat of the barrio is the hunched-over and arthritic-suffering yet spry and twinkling woman who is everyone’s abuela, or grandmother, Claudia. 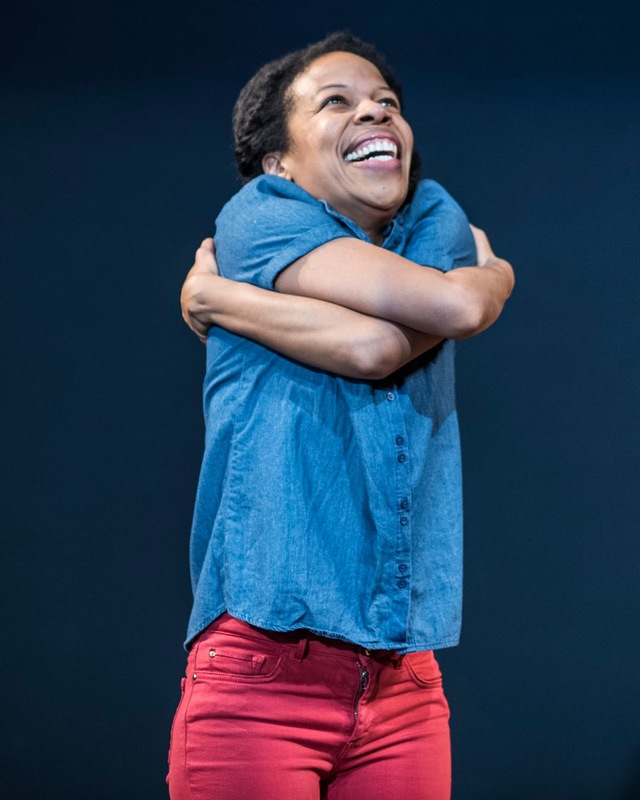 Michelle Navarrete is an inspiration and a delight as the old-in-age, young-in-spirit, and wise-in-all-respects woman who raised Usnavi after his parents died soon after he was born in the U.S. The stories she relates of the struggles and sacrifices of her life where prejudice by the majority was a frequent visitor is perhaps the most touching, most impactful sequence of the evening. All of these people’s lives intertwine during three, sultry days and sticky nights in July when a sudden blackout throws their world into discomfort and unease. The issues of love and family as well as difficult decisions being made by several to close or transfer local businesses for personal or financial reasons occur as the world around them is on darkened edge – even as the fireworks of July 4 light the sky in attempts of celebration. Tensions rise in all directions until Abuela Claudia reminds them all in one unexpected minute what life and family is really all about. The story of these recent immigrant citizens is indeed an American one that needs to be told, now more ever. 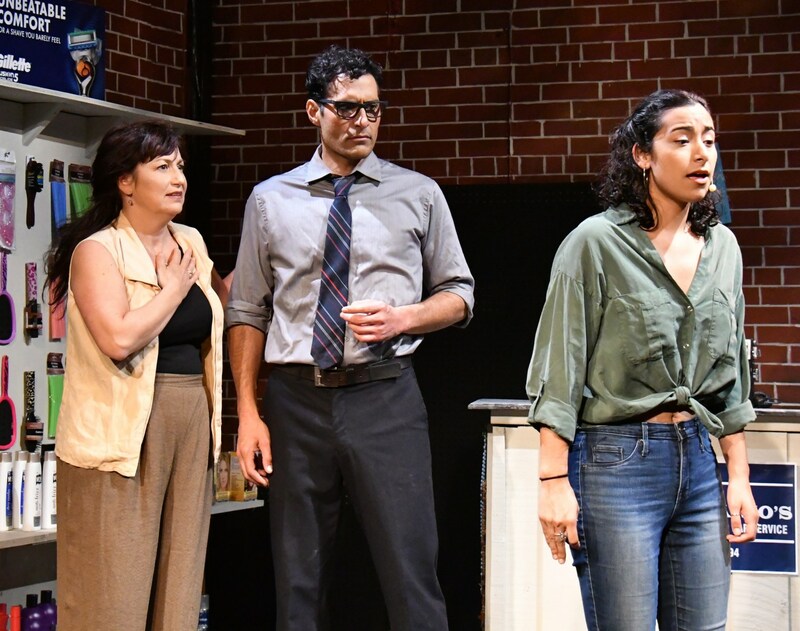 As director, Nicole Meñez takes this big-stage tale and brings it into sharp focus on the small, close-up stage before us. She also choreographs some rousing numbers that have a lot of spark and high energy even if they do not always work as well musically. 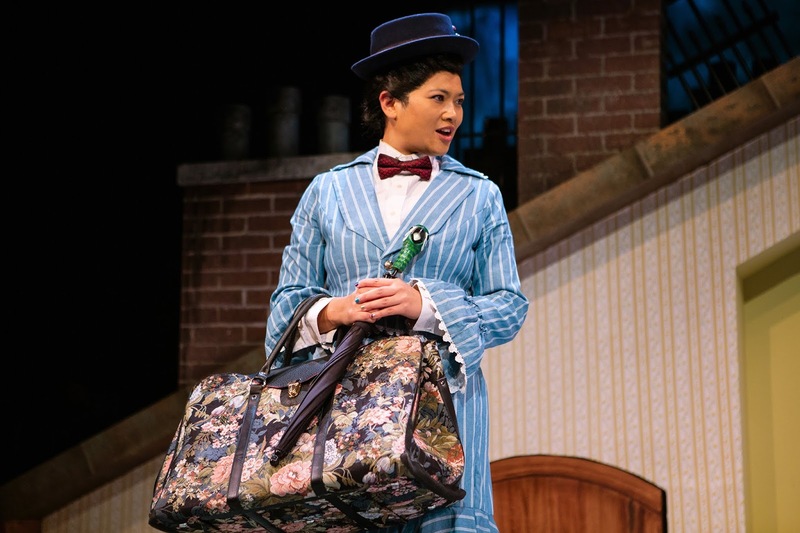 Mariely Cortes finds ways humorously and lovingly to portray each character’s personality and sometimes quirkiness through her costumes. Stephanie Dittibern has excelled in designing properties that make us want to go shopping on stage for a treat or two. 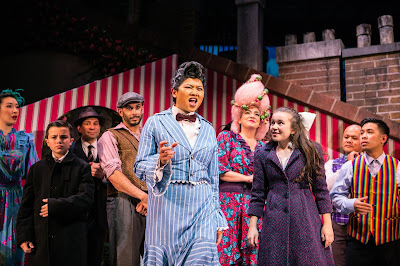 Where the show falls and often falls flat is in too many of the romantic duets as well as in the some of the small group and even full-chorus numbers where one or maybe two voices go off key too far or simply over-sing in ways to mar the overall number’s effect. Unfortunately, there are too many of these “like-fingernails-on-a-chalkboard” moments scattered throughout here and there to be ignored. 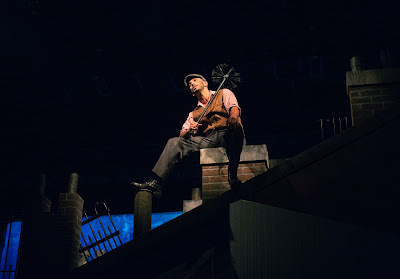 Coupled with the musical issues – at least on opening night – were problems with sound balance, missed lighting cues, and a collapsing, background wall that someone chose noisily to fix during one of the solos. All of these latter issues certainly will be corrected during the run. But in the end, Custom Made Theatre Company should be commended for stretching the boundaries of is stage to pursue a show other companies its size would probably never consider. In this case, the result falls short musically; but the cast still finds a way to tell a moving, important piece of recent, American history. 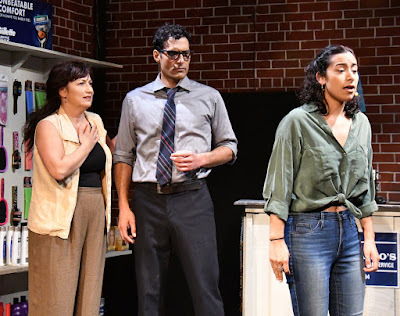 In the Heights continues through December 15, 2018 at Custom Made Theatre Company, 533 Sutter Street, San Francisco. Tickets are available online at www.custommade.org or by calling 415-789-2682 (CMTC).